Plans to regenerate Bradford city centre, including the long-delayed Broadway shopping centre, have been given a £35m boost. Labour-led Bradford council has secured £17.6m of regional growth funding from the government, which it will match. It plans to create a "growth zone" in which companies would get business rate relief in exchange for helping people get training and jobs. It also said the funding would boost confidence in the Broadway scheme. Work on the shopping centre began in 2004 but was halted in 2008 when the economy stalled, leaving a building site in the city centre. Developers Westfield announced in the summer revised plans for a scaled-back £275m project, which was described as "more market-relevant and desirable". Marks and Spencer has committed to becoming one of the anchor stores at the site and a council spokeswoman said Monday's Regional Growth Fund announcement should give other retailers confidence in the scheme. Council leader Ian Greenwood said: "Regenerating the city centre is a top priority for us. 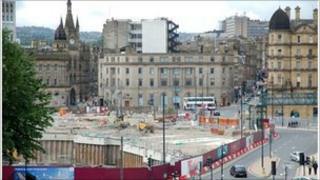 "This is a major boost for Bradford and... demonstrates we are moving in the right direction. There is now a strong set of factors to attract business into the city centre." David Green, the council's executive member for regeneration and economy, said: "This is great news for Bradford and it is positive to see the government has recognised the potential of the city centre. "We worked hard to secure this investment, supported by Liberal Democrat group leader Jeanette Sunderland. "It will provide support for new and existing businesses in the city centre and lead directly to new jobs for local people."